I can’t tell you how often, in one magazine after another, I read about what’s HOT and what’s NOT in home decor. Like anyone else, I peruse the lists but at the same time, I LOATHE these lists because they instill a fear in homeowners that they are going to somehow make a decision that will negatively time stamp their home. While it is true that trends blow in and out like the wind, I wholeheartedly believe that if you surround yourself with things that you love, your home will always feel warm and happy. Most importantly, I cannot emphasize enough that it is impossible to beat time. Time will always win. There is NO WAY to build a timeless house. In ten years, your ten year old remodel is going to look ten years old. 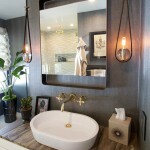 Yes, even the “classic” style that is so popular right now with the white subway tile, the carerra marble and polished nickel fixtures is going to look ten years old in ten years. Even though someone named this style “classic” it is still very reflective of the time in which we live. When the economy is slow and scary, greys take over. Grey are safe. They are calm. They are stable. Any other color would be bold in an unsteady economy. But, now, as the economy is moving forward with vigor, we are beginning to see some bursts of color and risks in finish that were absent just two years ago. The purpose of this post? To give you confidence to design your home to reflect YOU! Make your home comfortable for you and everyone else who lives there. If you currently just love grey? Then stick with it. But if you favor some other color, you will love your house more if you surround yourself with colors that make you feel at home. Paint is just paint. While you live in the house, paint your walls a color that you would love to look at. But, when you sell the house, if those colors are not neutral, they will need to be painted over since we all find comfort and distaste among different hues. And if you’re thinking it would be safest to just paint everything neutral right now in order to avoid the work later? Walls and trim often start looking like they need touch ups in about three years so it is very likely that they would need painted before your home sells anyway. And if you love sticking with what’s HOT because it makes you feel right, then do it. But please don’t ditch something you love just because it’s on the NOT list. Chances are, it will be back on some other sort of list in no time. #LOVEYOURHOME! We made BEST OF HOUZZ 2015! !